I've been thinking about writing this post for almost a year now. 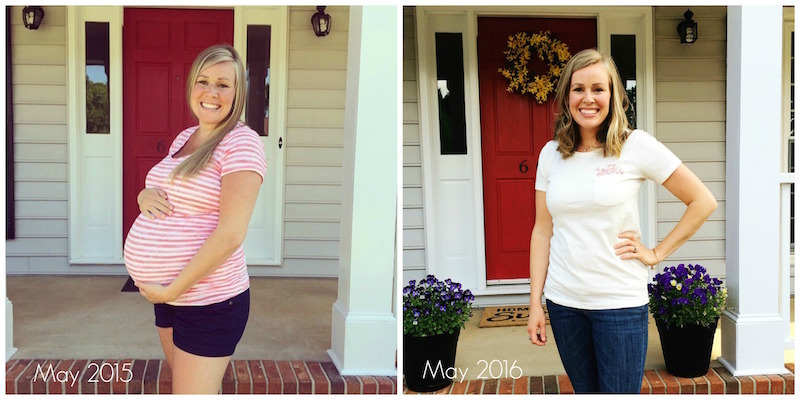 The journey of postpartum weight loss is different for everyone, but for me it was a huge struggle. I'm passionate about good food but self-control is not one of my strengths, so losing the weight I gained during my first pregnancy was not a walk in the park. As I'm now faced with trying to lose all of the weight from my second pregnancy, I thought I would share my story and a few thoughts for those of you that may be walking this same road of losing weight after baby. When I was pregnant with Madeleine I gained a little over 50 pounds. I had a really challenging first trimester which prevented me from keeping up with any sort of exercise routine, but I also know I ate way more carbs and sweets than I should have. People (and my doctor) made comments about my weight gain, but I honestly felt helpless to do anything about it because my cravings for both the quantity of food I wanted to consume and the types of food I wanted to consume seemed so out of my control. I had a long and difficult birth with Madeleine, so it was a while before I was up for even the littlest amount of physical activity. At my 6-week check up my doctor told me I needed to wait an additional few weeks to heal before I could start exercising. When I finally healed, I started running but only kept that up for so long. I honestly didn't do anything too structured to try to lose the weight: we tried Whole30 (and failed miserably!) and I tried counting calories, but neither of those was sustainable for me. Like I said, I seriously struggle with self-control, and I just didn't want to change how I was eating and sacrifice my normal diet. It took me four months to get within 15 pounds of my pre-pregnancy weight, but it took another six months for me to finally lose those last 15 pounds and hit my goal. I lost an additional 2 pounds to lose a total of 55 pounds in 11 months. And then I found out I was pregnant two weeks later. My second pregnancy was more challenging than my first, and even though I was throwing up a lot in the first trimester, I was constantly starving and eating everything in sight. Again, I made poor eating choices because I felt so miserable, and I couldn't keep up with any exercise. In my second pregnancy I gained 55 pounds. My recovery after Cora's birth (her birth story to come at some point, I promise!) has been so much easier than with Madeleine. I've been out walking already, and it feels so great to be moving and exercising! I've lost 20 pounds so far, but I have a long way to go. It's really daunting to be back in this same spot looking down a long road of trying to lose so much weight and working to fit into my normal clothes. It's easy to feel discouraged when I compare myself to other young moms who seem to lose the weight easily. It's easy to make healthy choices one day, only to have a rough night with little sleep and give into the temptation to eat three cookies the next day. It's easy to feel depressed when I feel like I have nothing wear. It's easy to feel like I'm never going to get my old body back, so what's the point. It's easy to feel bitter about the toll childbearing takes on my body, instead of joyfully giving of my body for my children. I think it's probably safe to say that I'm not alone in having these feelings. Pregnancy, childbirth, life with a newborn, life adjusting to multiple kids - these are all very real and very hard things, and losing a lot of weight after and in the midst of them is challenging! "...realize that your body is a testimony to the world of God's design. been used for His purposes. So don't resent it, enjoy it." You look so so cute in both pictures!! Thanks for sharing your journey and the challenges. This encouraged me as I've been working on losing ~15lbs for the past, oh, 2 years. My metabolism just UP AND LEFT a couple years ago. It's hard to keep eating relatively well/okay and exercise fairly frequently but not be able to just lose a pound or 2 overnight like I could in college. Boo. Thanks for your honesty here, Sherri. Yes, it is such a struggle in all of the ways that you've mentioned. I'm not sure I'll ever get over the state of my belly button. 14 months after my last baby and I still have about 7 pounds to go to my goal weight. Self-control issues must be hereditary; but I'm going to push on with you and we can do it! Thanks for sharing, Sherri! Your post was so encouraging to me. I often feel depressed and frustrated by the lack of pants that I can get on, and just the new way I'm carrying weight, not to mention struggling to lose it! But I love that passage you shared at the bottom. It's also helpful to know other moms who are feeling the same! I'm thankful we can all encourage and push each other to give our bodies grace and make healthy choices! This. This. All of this. So needed to read this tonight! Thank you! With regards to diet pills, there are some that are profoundly powerful; however the vast majority of them are equipped towards treating heftiness. They are generally not prescribed in the event that you are endeavoring to get in shape for stylish reasons. This is basically because of the way PhenQ Diet Pills tend to work too emphatically that they trigger a few conceivably perilous symptoms. Taking these require additional care and supervision from an authorized doctor. It is just utilized as treatment for stout patients since corpulence is as of now considered a genuine condition that can put the individual's life in danger. Be that as it may, on the off chance that you are not corpulent, at that point there's no compelling reason to place yourself in threat of symptoms just to shed off a couple of additional fats. The medications and components utilized as a part of these diet pills are totally legal and they give a changeless answer for stoutness. That is the reason; Phen375 is one of the best offering weight loss item and an effective approach to shed pounds. This guarantees the high caliber of this item. These pills are sheltered and harmless to utilize. In any case, ensure that you allow just the prescribed measure of dose as finished dosage can prompt a few medical issues. I’m sure you will provide the more awesome blogs like these blogs that I’ve enjoyed a lot 15 day diet plan. Therefore, since fat contains only about 10-40% water, when the body moves into the fat burning phase of a weight loss program,vitamin b complex ingredients the bathroom scale tends to be much slower than when glycogen was being burnt for energy at the beginning of the diet. The Sustanon250 Boosts your Testosterone to healthy levels. Find out more information on Sustanon250 in Canada, only at CanukLoves.com. I really appreciate your post and the love between you both of them.When ever one wants to loss weight he or she decided that they will start starving and stop eat junk foods or such food that consuming calories.All the way on which you worked-out for weight losing is highly appreciable.Here are Weight Loss Calculator through which I calculate calories that I needs, calories deficit and also this weight calculator suggest my ideal weight according to my height. Pregnancy programs can give you a good thought of your as date, however they are not always true.Human minds like certainty. Awaiting the infant to come with a proper date may be frustrating and exceptionally demanding. Possessing a likely day to appear ahead to is likely to produce the wait simpler. Being pregnant calculators hence provide us an ever-nearing horizon of enjoyment which makes the lengthy wait of nine months more bearable.Try pregnancy calculator to track your pregnancy week by week. Some pregnancy calculators offer the extra benefit of assisting you to determine when you are fertile. By inputting the very first day for the final stage in addition to the number of days on your cycle, then the calculator can give you a general idea of if you need to most actively try to conceive. Additionally, it will tell you once you certainly can expect a positive pregnancy test if you're pregnant. Knowing when you might be most fertile can help you raise your opportunity to become pregnant.Try this pregnancy calculator app through this you came to know about pregnancy week by week ,although due date of pregnancy. We don’t make fake promises, try the cb1 weight gainer and experience the benefits taking over you. The first thing that you ought to start looking for in a more totally free online weight-loss method is that a set of hints which are useful in your trip to lose weight. A excellent application will supply you with all the info which you want - the significance of all the food collections, precisely how many calories that you need a day, different kinds of extra excess fat, and other similar information.If you wants to track your weight on daily basis then use this weight loss tracker app through which you can easily came to know about your calories level. Velez, Valeria . 2018. “Phen24 investigación científica: El Pastilla Natural Para Adelgazar.” Adelgazaroficial.Com Ie. Adelgazar Oficial. Accessed November 2. https://adelgazaroficial.com/#phen24/. The Upside. It can be easier to lose weight on a plant-based diet because it allows you to eat a higher volume of food for fewer calories, Cheskin notes. It's important to eat less processed foods and more whole grains, beans, vegetables, and fruit. Emdeon leads the industry in clearinghouse and eServices solutions for automated EDI workflow that decreases electronic claims receipt and pre-processing cost, reduces phone calls from providers and improves auto-adjudication rates. Este es un artículo muy informativo. También puede reducir el peso masticando la comida varias veces. Coma y beba lentamente Black Latte diariamente para quemar grasa corporal. Undoubted pioneer among common weight loss pills in 2007 is Proactol - recognized by wellbeing experts and clients as great and safe weight loss support.